Thanks for visiting my blog! How did you find me? I LOVE that you are learning to knit. I've just recently tackled crocheting and can't even count how many times I've ripped it apart and started again. But the process is still fun! If you get a chance you should pop over to my other blog too! Kid books are good starting places for so many things!! Often it's just my speed. 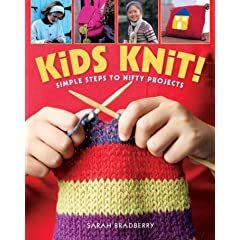 A kids knitting book is exactly what I started with as well. :) So much less intimidating. 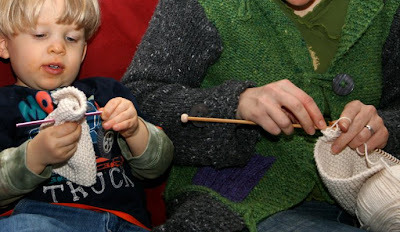 Those knitting mushrooms are great...the knitting goes so fast on them, which is quite satisfying for kids. me too. i began with a kid's knitting book "A First Book of Knitting for Children" by Bonnie Gosse and Jill Allerton. love that book. That knitting book is similar to the one I learned from- happy knitting!